Three very important things I noticed during my second viewing of "Wonder Woman"
Because I love a good cry, I decided it was a very good idea to see Wonder Woman again. 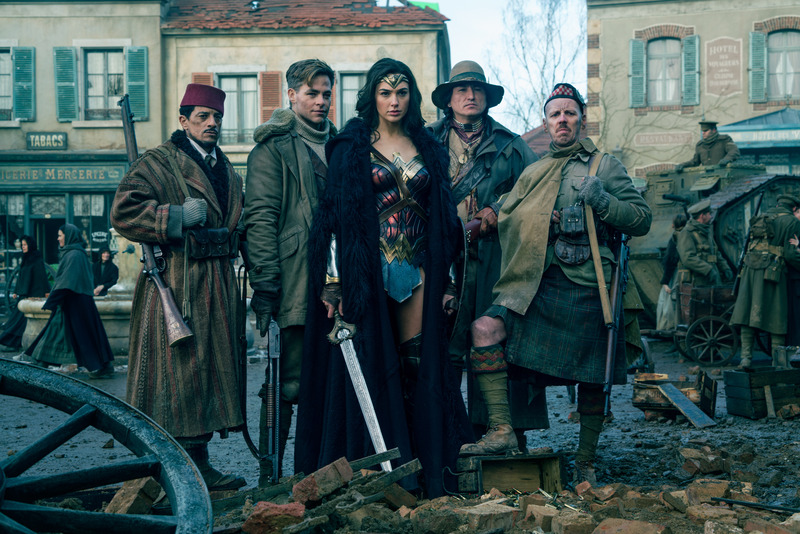 TBH, big superhero blockbusters usually require at least two viewings for me to fully grasp the scope and chaos of the movie, and Wonder Woman is no different. Obviously I was going to see it again — but also, I was going to see the movie again if only because it is the gd best movie I am going to see in theaters this year!! I went into the movie knowing I would bawl hysterically through it again, and I did, so that was fun. But, upon second viewing, I also noticed a few ‘lil things I would like to share with you now. Maybe you missed them, maybe you saw them the first time around. Either way, it’s a nice therapeutic thing to talk about Wonder Woman as much as possible. It will also probably encourage the other, like, 10 people out there on the planet who haven’t seen the movie to snag tickets. I’m only doing this for the good of everyone. Know when Diana, Steve, and the rest of their gang are in Germany and in order to take out the sniper, Steve does that cool “shield” trick? First viewing I was like “uh, how did Steve know to do that with Diana? How did he know she could jump that high?” It was a little odd, and I was confused. However, upon second viewing, I realized that Steve actually watches Antiope do this on the beach. One of the Amazon warriors yells SHIELD, and majestic AF Antiope jumps through the air and fires *three* arrows into *three* different dudes at the same time. So that’s how he knew Diana could also perform this incredible feat. Diana shows up in London, and immediately causes a commotion, as you do. While Steve is trying to handle everything diplomatically, Diana bursts into one of the Very Important Meeting Rooms that happens to be Filled With White Men. There’s a hush as they realize she’s in there, and the man speaking at the time – Sir Patrick – stutters a little as soon as he sees Diana. Since this moment takes place very early in the morning, we’re left to assume he’s simply charmed by her beauty and grace. HOWEVER, seeing it a second time, I realized he’s not stuttering because he’s startled to see a woman in the chamber. He’s stuttering because he realizes that this is Diana of Themyscira, aka the God Killer, aka the only person who can defeat him. Oh no, Sir Patrick is scared. It is very clear that Steve immediately falls in love with Diana, and duh. We all immediately fall in love with Diana. Chris Pine’s performance is the movie is OSCAR WORTHY, and even if he doesn’t win a real Oscar, he’s won about 45308909 Oscars in OUR HEARTS. After Diana saves the day, and saves the small told of Veld in Germany, a photographer asks to take the group’s picture. While he’s getting ready, and everyone is reading themselves, Steve steals the slightest glance at Diana, and a tiny ‘lil smile appears in the corner of his lips. BECAUSE HE IS SO PROUD OF HER, AND SO ARE WE. Okay, that’s all for now. Go see Wonder Woman. Onto viewing #3!